From dressing up like pirates and princesses to ghosts and goblins, Halloween is a fun and exciting time for many children. Each year, children look forward to parties, haunted houses & hayrides, and of course adventuring through the neighborhood, door-to-door in search of candy. Trick or treat dates and times may be different in each town, but one thing that should remain constant is making safety a priority! Here are some safety tips to ensure your child continues to have good memories and enjoy Halloween for years to come. Young children should never go trick or treating alone! They should always be accompanied by a parent or a responsible and trusted adult. For older children, they should always go trick or treating in groups and stick together at all times. If your child would happen to get lost, encourage them to stay in well-lit areas and go to a familiar residence they know is safe to ask for help (of if they have a cell phone use it to call home). Planning a trick or treating route in advance is perfect for knowing where your child is expected to be at all times. Walk, don’t run from house to house! Be sure to use sidewalks whenever possible and look both ways before crossing the street. Follow the trick or treating guidelines set forth by your community and keep track of the time. Many residents in the community will be expecting children to be out trick or treating between a designated time period and will be looking out for their safety during that time. After the time has lapsed and in dark conditions, there is a greater chance for incidents and accidents to occur. 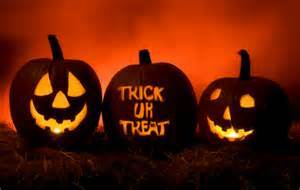 Children should wear reflectors or reflective tape on their costumes & treat bags, as well as carry a flashlight or a glow stick. This will help make them more visible to others and vehicles on the road. Encourage your children to hold off eating any of their candy & treats until they are properly inspected by you. Never eat anything that is not completely sealed or is unwrapped. Children should also avoid eating homemade treats from anyone they do not know. Children should never go into the home or car of stranger. This may seem appealing to a child in adverse weather conditions where they may be cold or wet due to rain; therefore, it is important to remind them not to do so, even if you think they know better. Children should stay close to home and trick or treat in neighborhoods they are familiar with. Sometimes the biggest safety concern can be the costume itself. Make sure costumes are flame resistant and not too long to avoid tripping. Accessories like toy swords & knives should be soft and flexible. Make sure masks don’t impair vision and shoes are comfortable and safe for walking. Halloween does not necessarily have to be unhealthy! Walking during trick or treating is a great form of exercise. Also, you can pledge to give healthier snacks or non-food items to help children that may have food allergies. Painting a pumpkin teal and setting in on your front porch, alerts parents that your home is safe for a child with food allergies. We often tell our children to beware of strangers and give them helpful advice on protecting themselves if left home alone or faced with a potentially dangerous situation; however, how often do we take our own advice? For many of us, we feel safe in our homes and our neighborhoods. We watch the news reports and think to ourselves, “that would never happen here” or “that would never happen to me!” Unfortunately, just like accidents, incidents of crime can happen when you least expect it! It is always best to prepare yourself and do your part to keep you and your family safe! Adopting a few simple day-to-day safety practices can help keep you stay protected. Remember to Lock-up: Before we go to bed each evening, we usually check to make sure the front door to our home is locked; however, we sometimes forget to secure that windows and other entrances are locked. It is worth taking a few extra minutes each evening to double check the security of your home, so you can go to bed with peace of mind. Use a Buddy System: We always talk to our children about safety in numbers and going places in pairs; however, as adults we put ourselves in dangerous situations walking by ourselves late at night to get home or to our car. Don’t be afraid to ask someone you trust to walk with you. Keeping pepper spray and a flashlight with you is a good idea. Keep your car keys in your hand as you approach your vehicle, so you can set off the alarms to scare off any potential culprits if you feel unsafe. Staying alert, walking with confidence, avoiding the use of headphones, and planning your route ahead of time can aid in your safety. Share Schedules: We have likely all been in a situation where someone we care about is running late. We call their cell phone, but it goes straight to voice-mail due to a dead battery or being in a limited service area. By sharing schedules with your family and friends, our loved ones can know where we are and we can know where they are. This can help in tracking someone down in the event of an emergency and although we don’t want to think about it, can aid in helping authorities if someone went missing. Who’s at the Door? : In the same way we tell our children not to answer the door for strangers, we need to do the same! We can be too trusting and are quick to open the door as soon as we hear a knock or the doorbell. It is ok to ask someone to identify themselves before you open the door if you do not have a good visual of the person.